Hello Sunshine! For me October best represents Fall. The morning air is crisp and the leaves are starting to show their brilliant colors. Mums and ornamental cabbages are out and all sorts of pumpkins are on every market stand. Plaid throw blankets, the smell of roasted marshmallows, hayrides, candy, comfort foods, and the whisper of Christmas coming. Aah, Fall! A couple of weeks ago we had our first seasonal cold spell and I immediately decided to whip up a new recipe. It was the most delicious soup that my family keeps requesting. I hope to share it with you soon. In Fall my family does a lot of outings, more so then in the summer. We try to get out of the house and enjoy this weather as much as possible. The pumpkin patch is by far our favorite activity, we enjoy going every year. We just finished building a fire pit just in the nick of time for marshmallows and s'mores! Before it gets too cold we are packing our picnic baskets, Boo-Boo, and heading to the park for lunch. I might luck up and get to see Shakespeare In The Park. I want to try my hand at caramel apples again. Last year was an epic fail but the caramel was good. We would love to visit family on the kids fall break and while there go the the state fair. Funnel cake, anyone?! My boys want to go camping. Maybe I can get away with setting up the tents in the backyard! I've labeled October as my month to get organized. I feel the need to tackle a few specific areas in my home. I will share the spaces I am tackling, tips and storage solutions all throughout October. I hope you tune in and just maybe get a few ideas for your home! Whats on your Fall bucket list? Lots of fun things to do! 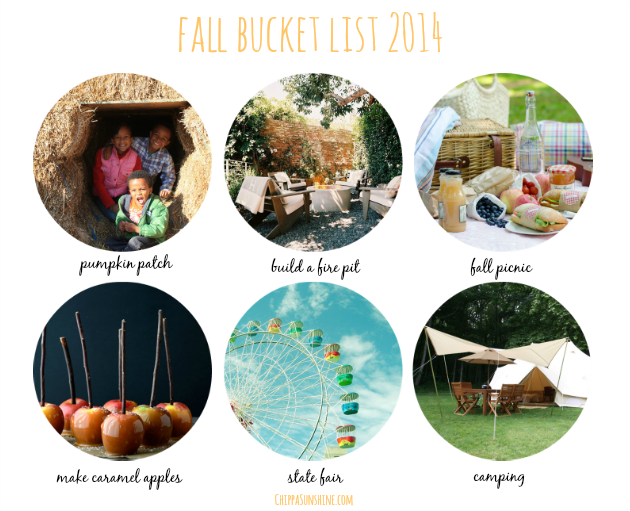 Hope you and the kids have fun going through your fall bucket list. I am itching for a good organizing system. Good luck! I would love to have a fire pit in my backyard. That sounds like so much fun!